In what I think is the last of this collection of pages on the Bonding Warehouse (‘Bonding Warehouse Week’ I should perhaps have called it), a few reminders of how the Bonding hosted comedy as well as music, thanks to Mike Bennett’s Comedy Shack. I remember in particular: Jo Brand, Mark Thomas, and Jeremy Hardy. Here in York’s own Bonding Warehouse. The Yorkshire Evening Press ‘Preview’ in November 1993 reported the imminent end of the Comedy Shack, a brave and and memorable venture, and one of the things making that building – the Bonding (as we called it) – ours, in that time. Those of us who were lucky enough to be there might remember, as AJH did in a recent comment, ‘trying not to go to the loo during a performance for fear of being humiliated by an eagle eyed comedian’. 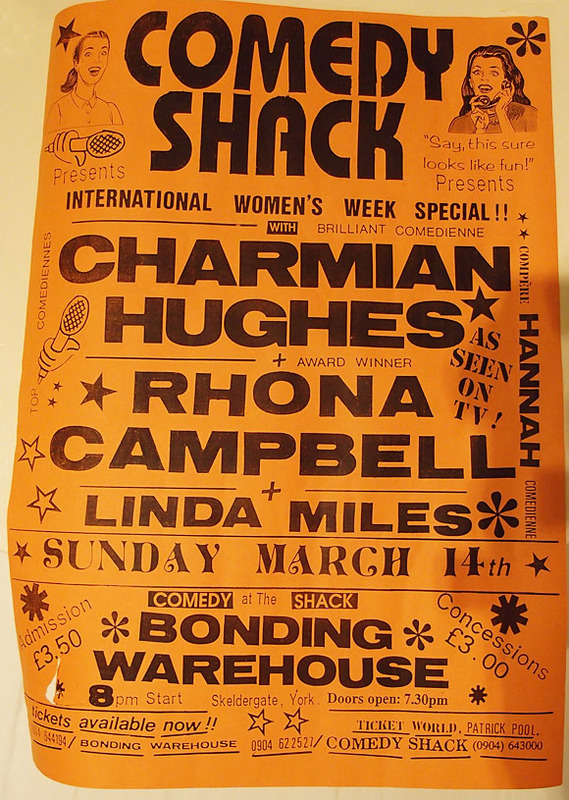 There are no doubt many copies of the Comedy Shack leaflets/posters in boxes in houses in York. 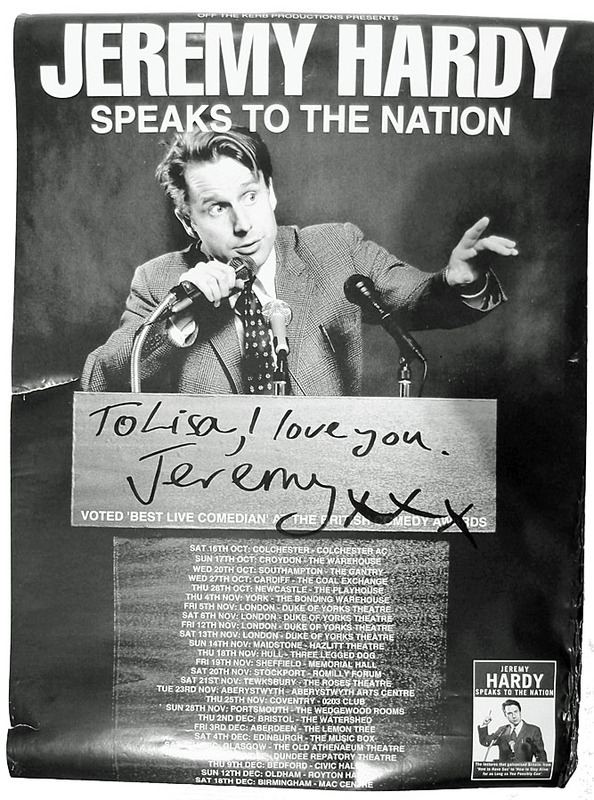 But as far as I know there were only a couple of posters signed at the Bonding Warehouse by Jeremy Hardy. And one of them is mine. And this one had a declaration of love. The cad … disappeared off back Down South and I’ve never seen him since. Thanks again to Mike Bennett for making all this happen, at the Bonding Warehouse, when it was ours. Brilliant stuff, it’s absolutely fascinating looking back and recognizing all those names, like a who’s who of comedy. Seeing Simon Pegg third on the bill on a wet Sunday night in November, there’s hope for us all! Many thanks for bringing this back to our attention. I was very sad to hear yesterday of the death of Mike Bennett. He died at the weekend after a long illness. I didn’t know Mike well, only to occasionally chat to in the street, or years back in the pub. The last time I spoke to him was some years ago when I passed the door of his museum at Monk Bar, saw him and stopped for a chat. 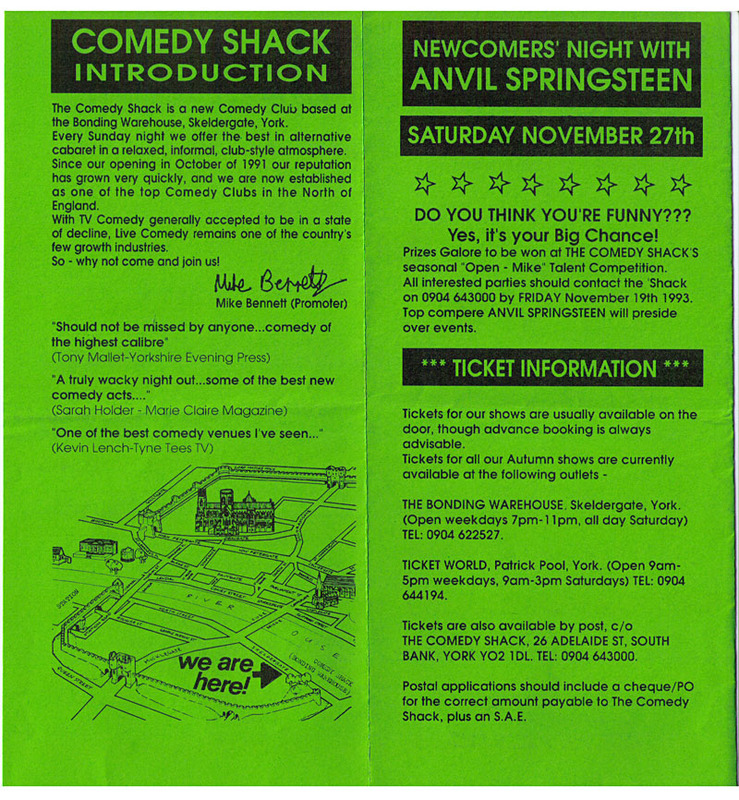 I’ve had these Comedy Shack leaflets collected together for some time, kept meaning to put them online. I was prompted to do so last week partly because the Bonding Warehouse redevelopment had brought to mind the many memorable events the building had hosted, but also because I’d read that Mike had retired from the Richard III Museum. I first talked to Mike Bennett in around 1984 in the Cross Keys on Goodramgate in York. The layout of the pub has changed since, but I remember standing near the Deangate door and that he gave me a cigarette. I don’t usually remember the first time I talked to someone. Perhaps I remember it because he was a bit older than me and knew loads of cool-looking people in bands, and so I was a bit in awe. Perhaps it was because I thought he was rather handsome and debonair. Or both. If I recall correctly, at that time he was writing music reviews for one of the local free papers. 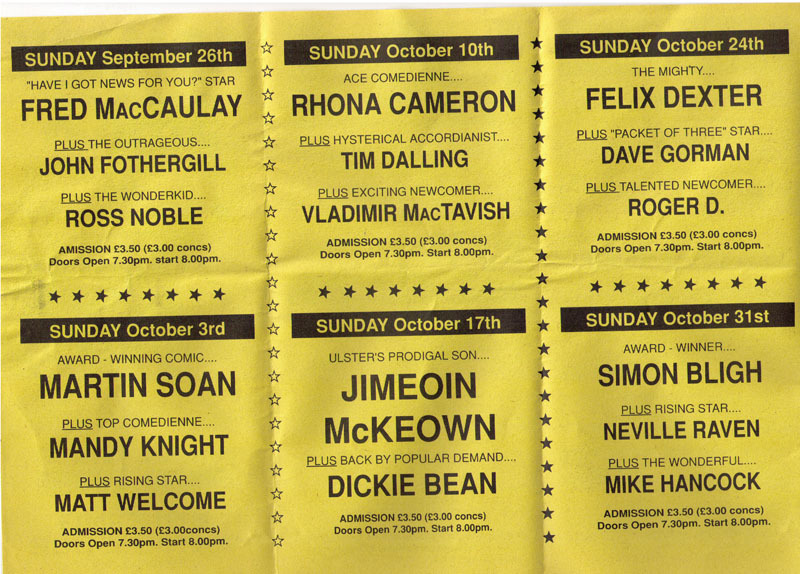 Our early 1990s evenings, as discussed above, were brightened by the comedy club he founded. It’s thanks to Mike Bennett that I have my signed ‘declaration of love’ poster from Jeremy Hardy, as afterwards me and my friend Alison were telling Mike how brilliant we thought it had been, and he said he’d get us some signed posters (no doubt preferable to a giddy direct approach by two tipsy women). After the Comedy Shack Mike founded the Richard III Museum in Monk Bar, and ran it for 20 years. He recently wrote about those years in an article for York Mix. He was also one of the main contributors to The York Book, an extremely useful and interesting guide. What I remember most, and it’s something I hope there’s a video or at least audio recording of somewhere – a comedy sketch he and a friend did, called, I think, the Intellectual Footballer, in which there were none of the usual post-match interview clichés, but instead phrases like ‘Pyrrhic victory’. I remember laughing so much. Thoughts now with his wife and family and friends. RIP Mike Bennett, and thanks for all you gave to York in the years you were with us. Hi Lisa – thanks so much for this! For some unknown reason, the Comedy Shack popped into my head today. I googled it … And here it is on York Stories. I remember seeing Rhona Campbell and Jo Brand, in particular. It’s fascinating, though, to see how many of those ‘newcomers’ are now such big names. 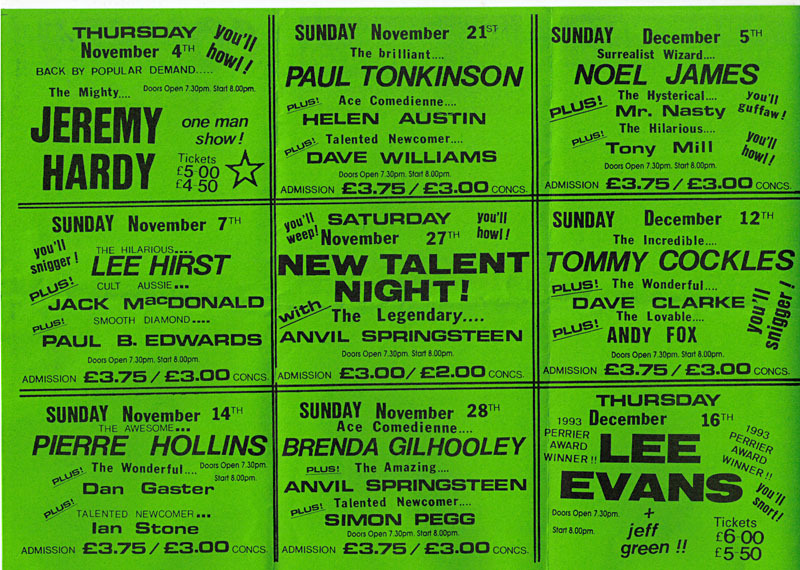 Yes we saw some fab people/bands there, didn’t we.